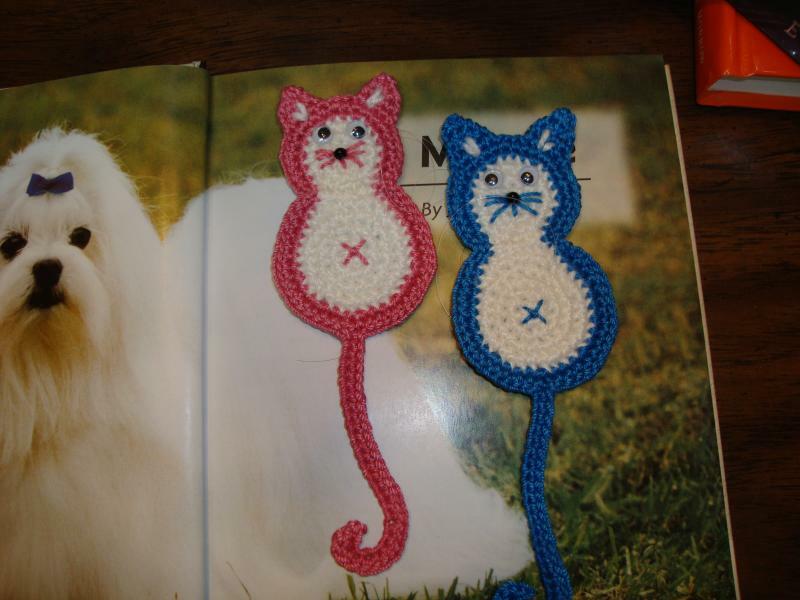 I made couple bookmarks for my two little neighbors (boy & girl). I made them from a picture from Internet. I changed that a little. I skip the legs didn't wanted to bother with that. And I put the tail where it belongs (bottom) LOL That tail on that picture was going up from the head, that looks very cute too. I used #4 thread for that. Now I am working on pencil containers for them. I am almost done with Minion pencil container for that boy. I do not know what I am going to make for that girl..??. Maybe Hello Kitty? or something else... I don't even know if she likes Hello Kitty, but I would think every little girl would like that. Maybe not! LOL. PS: That is a book about Maltese dogs. I have one of them:). They are not the first gifts you make for your little neighbours, aren't they? Well, the kids are VERY LUCKY to have you as a neighbour!!! 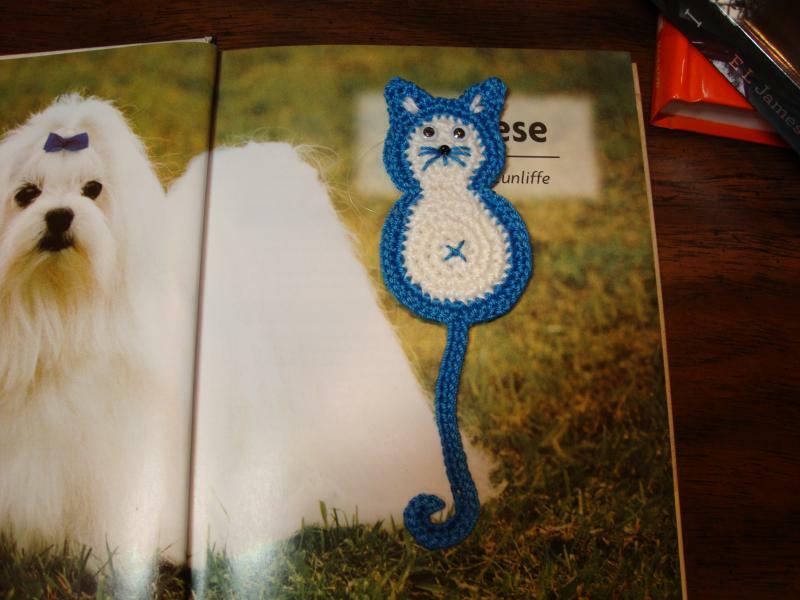 I love bookmarks and collect them - these cats are so cute! Oh my! Those are absolutely darling! Instead of minion, what do you think of doing Nemo (boy) and Dory (girl)? They are just adorable. I love the colors. For a girl any colorful pencil case is appropriate and does not have to be a character. Purple seems popular. Or maybe bluebwith silver snowflakes ....elsa inspired. Thank You Ladies for all those nice compliments! Who is Nemo? and Dory?. I guess I am out of touch..LOL. By any chance you are talking about Nemo that rescued Whale?. I am almost done with that Minion pen/pencil holder. So Minion it is for that boy:). 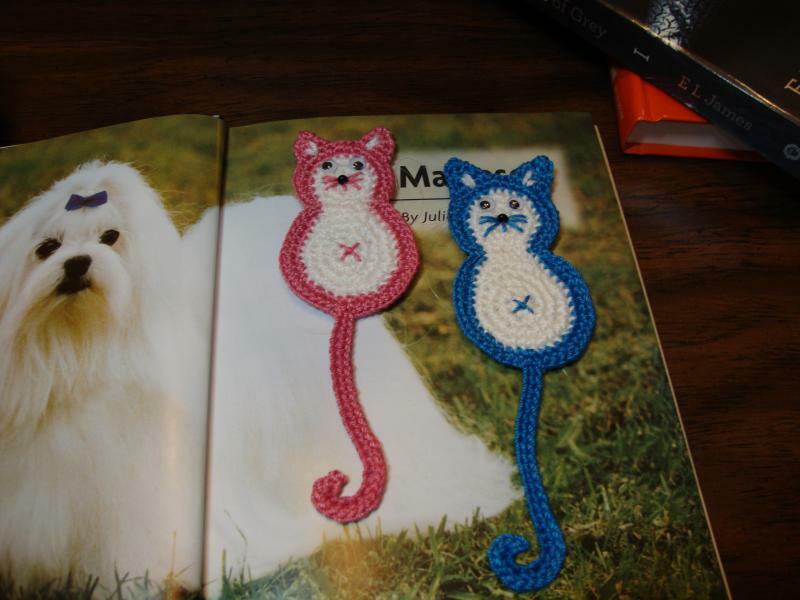 The bookmarks are very cute and your little friends will love them. My heart bounced when I saw the Maltie in the background. 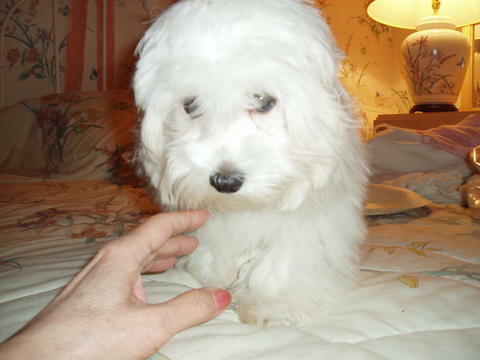 Not a day goes by since my little Tippi passed that I don't see a photo or a video of a Maltese. My Hubster says it's a sign I should get another. I so miss that little girl. Thank you for sharing. Ok, no Nemo, since Minion is almost done. Nemo and Dory are from "Finding Nemo", out a few years ago and "Finding Dory", out this year. Nemo is a clown fish. Dory, a blue Angel fish, is his best friend. Since my granddaughter is 6, I see a lot of animated movies. Finding Dory is my favorite this year. They are not the first gifts you make for your little neighbours, aren't they? Well, the kids are VERY LUCKY to have you as a neighbour!!! I love bookmarks and collect them - these cats are so cute!. Yes you are right I did made for them few gifts already. To tell you the truth I am considering my self Lucky LOL. They are my next door neighbors, they moved in here one year ago. When I find out they have two little kids I was very happy. 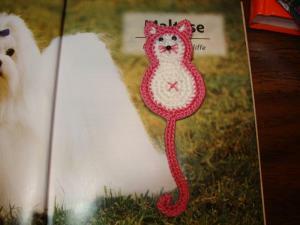 I just love to crochet that cute & silly stuff for kids that age. I first meet their parents couple weeks before they moved in and told them that I am very happy because I will have a good time making things for them! . My granddaughters are little older and they like different stuff.. I still crochet a lot for them, they like my Amigurumi & other stuff.. 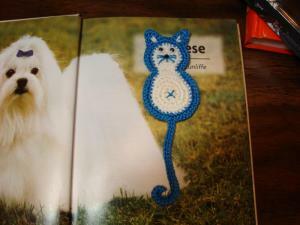 I can't crochet for them all that cute & silly stuff that I like to make because they are little to old for that. When it comes to my Amigurumi there is a big problem in their house. There is a "predator" who is destroying my stuff. That is Pandy their cat. She LOVES my Amigurumi way too much!! LOL. Yes I do crochet toys for Pandy and I do not mine when she destroys that because I do not put much work in that. . BUT, when I put a lot of work and a lot of time to crochet something very special for my daughter & granddaughters and Pandy destroyes that complitely in a matter of few days I am NOT happy! . Pandy licks that stuff to "death" everything becomes very hairy..like a very long fur. One of the items that she destroyed it was Easter Table Centerpiece. It was a big chocolate bunny with 6 Easter eggs decorated with beads & sequins in a big round nest. I worked on that for over 1 month, many hours. Pandy destroyed that and other stuff.. . She made everything very "hairy" and pulled out the yarn & other stuff...With proper handling & storage that would last them for many year to enjoy every Easter time. On the end my daughter give her that bunny to do whatever else she want to do with and all those beaded & sequeins eggs went to garbage. That was not suitable for a cat toy. Pandy goes everywhere!! with the exception of the fireplace mental..Somehow she can't get there. Because of that problem with Pandy I even bought a special cabinet - Curio ( it is in closed in glass around) for my daughter so she can keep my amigurumi there. But, that is not a full proof either. My granddaughters are very forgetful and sometimes they do not put things back in there. Well, that is a story about that cute and adorable Pandy LOL. You did mentioned that you collect bookmarks. How many of them do you think you have?. I am sorry to hear how much you missing your little doggie:(. I know how that feels. Before Cesar (Maltese) I had Gigi (American Eskimo). I still miss her sooo much:(. She was unusually smart & good. Cesar is little on a stupid side LOL. But I still love him very much. He is my baby! I do not keep his hair long like on that picture in that book because that would be way too much work. That would not be even good for him. I do hope that you will get your new doggie soon, that will help a little. I know I will be "OFF the subject" by doing that. But maybe I can get away with that..?, I hope:). Here is my little Cesar, he was trying to run away from that camera LOL. Cesar is adorable. My Tippi was camera shy too if it was a closeup otherwise she would even pose. I think it was the flashing light on the camera that bothered her. Two different times I grew her into a show coat but had to brush her 2-3 times a day. The groomer was always happy when I said "cut her shorter". She did love it when I crocheted and would cuddle up next to me each and every time. For some reason she loved the scented cotton yarn too, especially the lavender. Maybe someday another one will come along. She will get some kind of yarny nickname. LOL! Thank you for sharing- Now back to crochet! I don't know how many bookmarks I have, but I'll count when I'm back home. I'm out of town for a short holidays in the woods. I have many bookmarks because I love reading and usually when I visit some place I buy bookmarks as souvenirs. Some people collect magnets, I choose bookmarks. I thought that you only were talking about crochet bookmarks:). If is too much bother you don't need to count them, I just thought that maybe you know. I do not collect anything specific, I guess with the exception of YARN! LOL..
Well my favourite bookmarks are handmade - usually crocheted or stitched. I made a few for myself too. Those are the cutest things I have seen in a while! !